Toronto commuters are being asked to play detective. Pattison Onestop and Art for Commuters have launched Murder in Passing, believed to be the first-ever transmedia whodunit series for commuters, with new daily, 30-second episodes on Pattison Onestop’s Toronto subway screens, and online, January 7 to March 1, 2013. 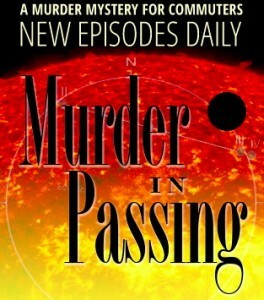 Written and directed by John Greyson, Murder in Passing is shot in the film noir style. Bike courier Mars Brito has been murdered … and everyone in the town of Passing B.C. is a suspect! Visit here to catch up and listen to the operatic ‘fugues’ composed by David Wall. Commuters can ollow the citizen detective’s blog posts, and find daily clues online, through Twitter, and in the Metro newspaper. We see that there’s a contest involved, too! This entry was posted on Friday, December 21st, 2012 at 11:01 @500 and is filed under DailyDOOH Update. You can follow any responses to this entry through the RSS 2.0 feed. You can leave a response, or trackback from your own site.